Interested? What if I told you I had a secret that could boost your child’s IQ quite significantly? Furthermore, that same secret would also improve your child’s behaviour and increase their self-confidence. Increase their exam scores and improve their memory, reading ability, and maths results as well. Too good to be true? Can I also add that it helps in the friendship stakes as well? The secret, well it’s been around for about 1500 years and started in India. It has been proven again and again to do all this and more. It’s available everywhere and it’s cheap. Best of all it’s a game! Ah yes, it’s chess. The old game of chess certainly delivers in the educational stakes. There are 1000’s of schools in more than 30 different countries where chess is now part of their curriculum. They have recorded and studied the effects and much has been written. It’s all true by the way, chess does increase IQ, and your child’s scores on exams and all I said it would. 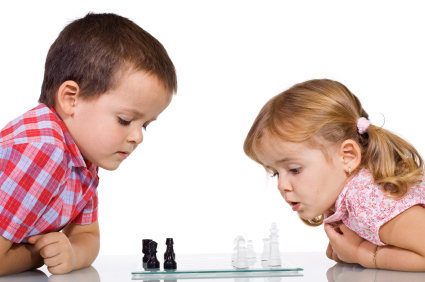 To quote a New York Chess Teacher John Kennedy, who implements chess in schools as part of the curriculum, "The most wonderful thing about chess is the way it transforms people from the inside out, once they're exposed to the instruction, kids get chess fever. And once they get hooked, their desire to apply themselves soars. The ability to concentrate – really concentrate -- takes a quantum leap the minute chess sinks in." What interests me the most now, is how brain scans have shown us that learning to play chess is a major part of treatment for a whole range of emotional and psychological problems. Such as dark thoughts, aggression, suicidal thoughts, rage, depression, moodiness, anxiety, ADD, panic, poor organization, poor judgement. I could go on. I recently attended a seminar where this cutting edge research was shown, brain scans and all. How does a game have such a profound effect? It is all to do with the parts of the brain that are used in chess and that are stimulated. To get technical the limbic system, the temporal lobe, the pre-frontal cortex. It is these areas of the brain that are underactive in all the problem areas I listed. Research shows stimulating these areas via chess, decreases significantly the symptoms of these problems. Now to touch briefly on children with special needs, a special education teacher, Nadine Kee, has this to say about chess's influence on her special needs students: "When students start playing chess, you can see the academic improvement immediately. From the first day when a child learns how to move a pawn, you'll a difference in their attitude, their behaviour, and their success in school." The beauty of chess is that it stimulates minds, builds skills all while kids are enjoying themselves. It is also a chance to teach your kids a new skill whilst spending a little quality time with them. Enjoy !